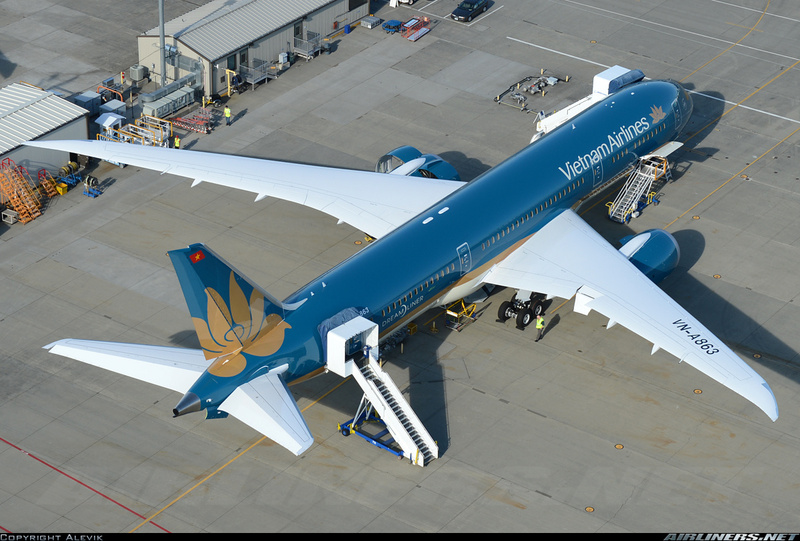 Welcome to my trip report on Vietnam Airlines Dreamliner! I chose the Boeing 777-200ER for the return sector (HAN-SGN), but a few days before the departure, my aircraft was changed to the 787 Dreamliner aircraft. Somehow it brings back memories of the Xiamen Air's experience when my scheduled and desired aircraft Boeing 757-200 was changed to the 787 Dreamliner. (Click here for the trip report) That's life, isn't it? 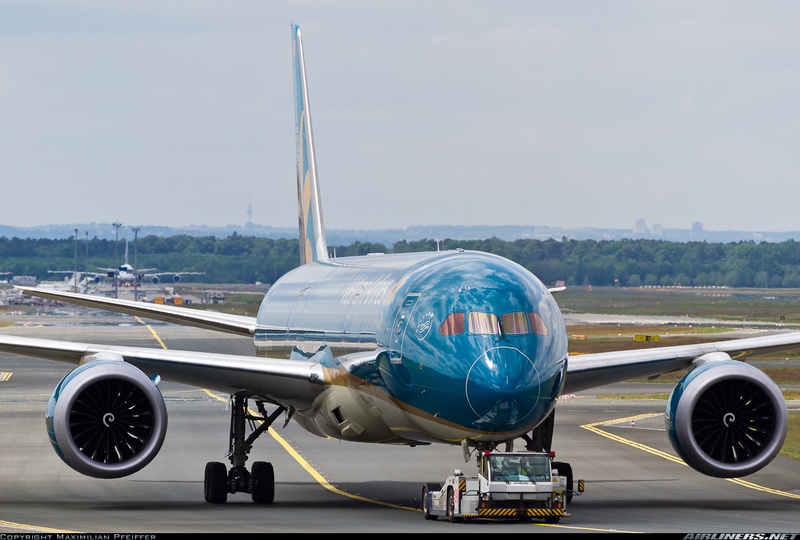 It is not my wish for it to happen but it can be a lot worse like the Boeing 777-300ER changing to a Boeing 737-800 or Boeing 787-8 Dreamliner aircraft changing to Airbus A319/Airbus A320. That makes life more interesting but frustrating for aviation enthusiasts. The night before, I tried checking in for this sector, but the application and website didn't allow me to do so, so I had to check in at the counter. Next time, I would buy separate tickets as the last time I did this, I can check in for both flights (selecting my seats early) without issues. After arriving at this airport from Ho Chi Minh City (Previous flight trip report can be found here, I had around 5 hours before heading back. I decided to check in to see if a flight change can be done without a fee. I did a check with the friendly staff, she told me the aircraft scheduled on my flight was operated by a 787 and unfortunately I had to pay a fee to change, so I told her it's ok, I stick to my flight and I requested for any seat in the Premium Economy Class cabin. Unfortunately, none was available and I was given seat 18A. Did a quick check and it isn't one of those windowless seats and that matters especially on an evening flight. There are separate queues for Ho Chi Minh City and other destinations. Slight change was made to the arrangement since the last time I came here. This is where I queued. There was only a couple of passengers ahead of me and not long after I got my boarding pass. Friendly crew was able to answer my enquires. Unfortunately I didn't get my desired Premium Economy Class seat. Another ride on the airline's 787 Dreamliner, hopefully on a different aircraft. First Class? How I wish! Thanks for the ride, VN-A886! This aircraft is on her way back to SGN. I went to Lucky Cafe 1 to have my lunch. Located a floor above the departure hall (land side). There are ac couple of cafes there including Lucky Cafe 2. Prices are quite reasonable and lots of hot food available. Airport Shuttle to Terminal 2 (Located at the first level). There are local people who will approach you to take their transport, ignore them and wait for the free shuttle service. Free airport Wifi is also available with just a survey and a click and you are online. Restaurants at the 2nd level. If you have a long layover, its better to come to this terminal as there are a good number of high end restaurants at the floor above the departure hall. These restaurants are great for hanging out for long layover if you don't have access to the lounges. Plane spotting area - suitable for photography! A good number of locals gathered here to enjoy the view of the apron. , Kenya Airways Boeing 787-8 Dreamliner, 5Y-KZB was on her way to Guangzhou. I flew on this aircraft last year, you can check out my trip report over here. 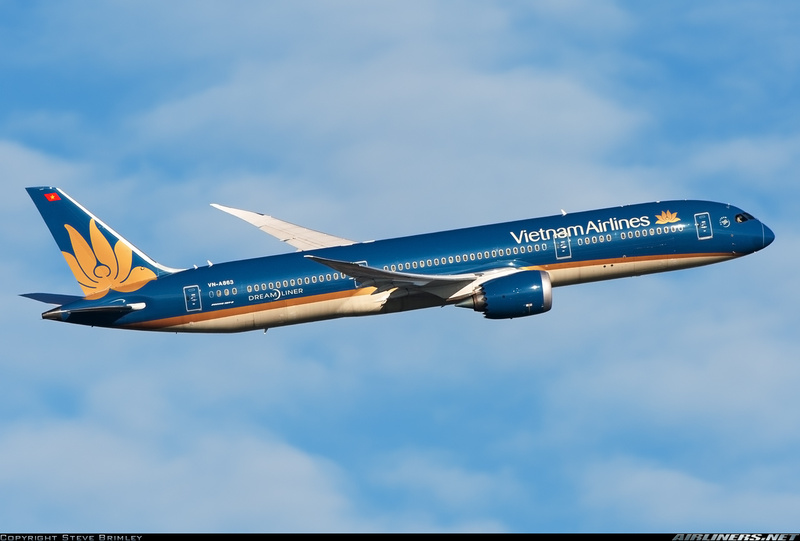 Vietnam Airlines Boeing 787-9 Dreamliner on her way to runway 11 Left for departure to Ho Chi Minh City. Vietjetair Airbus A320 from the distance. Do not lean against the glass! Some folks can get overexcited. Compare to the domestic terminal, this is more modern and nicer to hang out. A modern terminal - prefer this over Ho Chi Minh's international terminal. Back to the 1990s, I headed to the air side straight away. Few cafes and shops to check out. The interior is so different from the international terminal, reminds me of the good old days. The walkway to the other gates for Jetstar Pacific and Vietjetair. Did a check on which 787 would take me back to Ho Chi Minh City! The honour goes to VN-A863! Relief to be flying on a different 787 Dreamliner. My previous rides were on A862 and A864. On her now and if the Boeing 777 scheduled to operate on my flight didn't change, I would probably be flying on VN-A143. My aircraft followed VN-A143 to Hanoi. Boarding time! I only found out the aircraft was departing the remote parking lot when I saw no aircraft at the nearby gate. The airport bus that took us to the aircraft. I had to wait for the 2nd bus. Great to board the aircraft this way as you can admire the beautiful aircraft in front of you. My favourite aircraft: the Boeing 787 Dreamliner, this is the -9 series. For Business Class and more Economy Class photos, you can check them out at this trip report. I will try my luck the next time I book on the airline's 787 domestic flight. Ample legroom space - 38' inch same as the A350. The remote control is at the side and the IFE system is stored at the hand rest area. Glad to have the window! For those been following my trip reports, you understand why! My 787 Windowless experience: Click here. The bulkhead row may be worth getting - have to request for it at the check-in counter. IFE system - I was lucky I was able to use it briefly before the crew shut it off after safety video was played. For those wondering what IFE system is this powered by, you got your answer. I wanted to watch Hunger Games 2 for this flight sector, but unfortunately the system was not available after safety video was played. What I like is if you click the flight information (above) on the right corner, the information (below) will be shown. After boarding the aircraft, I made my way to the seat which was just a few steps from the 2nd door. I was still feeling slightly disappointed not able to get the Premium Economy class seat, otherwise this trip report would be more meaningful but still I would try it again the next time. Not surprisingly, the other 2 seats (3-seater) were taken up by 2 fairly large size passengers but the worst thing is this gentleman sitting beside me had his legs spreading wide open and part of his left leg (his seat: 18B) occupied part of my legroom space, touching my leg and not showing any consideration by sticking to his own space. I wasn't bothered by him occupying the armrest. I did hint to him a few times but he seemed oblivious to it. In the end, I gave up, was reluctant to confront him. Anyway, departure time went and we finally got ready around 1805 when the announcement was made for departure and crew went to lock and cross check the emergency doors. Once that was done, the sound of the engine starting was heard, not as loud as the GE90 engines. Once they were running and clearance was given, we taxied to runway 11L for departure. The weather was cleared and it was a beautiful evening for flying , we were soon on our way to Ho Chi Minh City. It was my 3rd time doing this flight sector, so I was getting used to the routine. Flight for most parts was smooth and apart from the inconsiderate seat mate, it was an enjoyable flight. The extra width space on the Airbus A350 is certainly an advantage but still I enjoy flying the 787. If let's say I get the whole row to myself on both A350 or B787, I would choose the 787 for sure. That's my personal preference. In-flight service was average just my other flights with this airline, nothing much to talk about. In-flight meal was served and drinks was followed after that. That's an advantage of flying this airline on this route over the Low Cost Carriers, Jetstar Pacific and Vietjetair. Airfares among these airlines (low fares) are not much of a difference. For the rest of the flight, it was uneventful. Flight crew came on the speaker to update us on our flight path. We landed at Ho Chi Minh late but not a big deal to me anyway and we parked at a gate this time round. So it was a good thing I managed to check out the In-Flight Entertainment system. Overall I prefer this system over the A350 as I find it to be slightly more user-friendly. I had a choice of chicken or fish, I chose the former. Presentation doesn't look very appetising but it was not too bad. I had coke for my drink, this was served later. Wifi was available on my flight but I didn't use it. Goodbye Hanoi, I will be back a month later! We were soon at the threshold of runway 11 Right. Waited for this Vietnam Airlines Airbus A321 to touch down before we taxied to runway 11 Left for departure. Nice weather as we climbed smoothly to our assigned flight level. Manage to watch the sky turn dark as we cruised over the country towards Ho Chi Minh City. My ride, VN-A863 parking at one of the gates at SGN airport. Thanks for the ride! The walk towards the luggage carousel was around 5 minutes. I felt slightly disappointed not to get the Boeing 777 on this leg but it was great to fly on the 787 once again although I had to put up with an inconsiderate seat mate. It was pretty uncomfortable especially when his leg kept entering my "territory". It would be tolerable for me if this seat mate had kept his legs and hands in his space. Between the 3-3-3 configuration on the 787 and the 3-4-3 on the 777, I find the former (787) more tolerable, it isn't a big deal if the seat mates beside you are considerate and not taking up more space than they should. For the Premium Economy Class, the 2-3-2 layout looks very comfortable and I hope to give it a try on one of my next domestic flight with this airline in the near future. Doing the Ho Chi Minh to Hanoi domestic route is the cheapest way to experience this airline's wide-bodies and will I fly on the A350 or the 787 on the long haul routes? Yes, why not? Now that I have more experience with the aircraft's products, I know roughly where the best seats are and if you need recommendation, feel free to ask. Hope you enjoy this report! You can check out my A350 Premium Economy Experience SGN-HAN at this link. For my other trip reports with this airline, please check out the links below. Enjoy reading your blog. Love both A350 and 787 aircrafts although, these will be dated again soon in the next 5-6 years. They said they are going to re-model the business class again in their next upgrade plan. Probably 2025 haha! That's a waste of money. The Business Class products aren't that bad. Instead, the airline should concentrate on improving its soft product instead (Customer service...etc). Great information! For everyone who need to know about price of Hanoi to airport, please contact with GoAsiaDayTrip - the most trusted airport transfer and day tour company in Southeast Asia.